Issue daq.getDevices in the Command window. Click on the device name in the list returned by the command. This example uses a National Instruments® ELVIS II with ID Dev2. Verify that its digital subsystem supports the OutputOnly measurement type. Create a session, and add 4 digital channels on port 0, lines 0-3. Set the measurement type to OutputOnly. These are connected to the four control lines for the stepper motor. Refer to the Portescap motor wiring diagram describing the sequence of 4 bit patterns. Send this pattern sequentially to the motor to produce counterclockwise motion. Each step turns the motor 18 degrees. 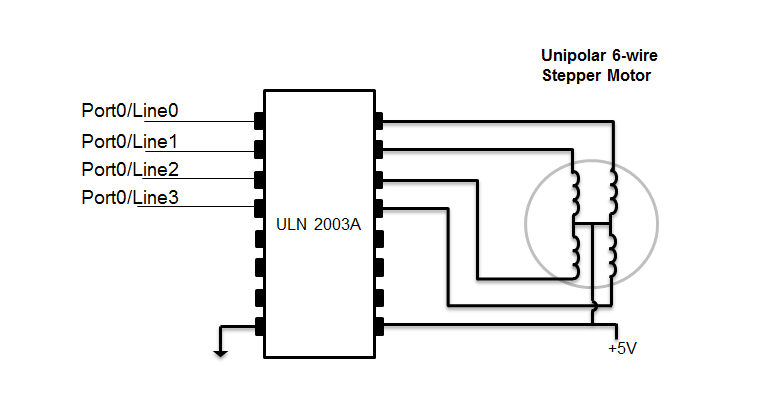 Each cycle of 4 steps turns the motor 72 degrees. Repeat this sequence five times to rotate the motor 360 degrees. Use outputSingleScan to output the sequence to turn the motor 72 degrees counterclockwise. Repeat sequence 50 times to rotate the motor 10 times counterclockwise. To turn the motor 72 degrees clockwise, reverse the order of the steps. After you use the motor, turn off all the lines to allow the motor to rotate freely.